Samsung Gave 200 Passengers On A Plane Free Galaxy Note 8 - Recovering From Explosions Or Playing With Fire? Samsung Gave 200 Passengers On A Plane Free Galaxy Note 8 – Recovering From Explosions Or Playing With Fire? When a multi-national giant makes a mistake, let it be known that everyone will talk about it for months and sometimes for years at a time. Now Samsung had a little fiasco with its Note 7 a while back. Do you remember? I am sure many of you know exactly what I am talking about. Does the phrase ‘exploding phones’ ring a bell? Yes, there you go. The tech giant faced a lot of negative media attention when Note 7 exploded on a plane due to battery problems. Now how could a company like Samsung recover from this? Samsung once again on a plane – are you anxious? I have to admit, the way they apologized to the customers, is something people will talk about for years. On Iberia Airlines flight number IB 0513 from La Coruña to Madrid Barajas in Spain, the passengers were met with a surprise. They were having a very pleasant and safe trip when Samsung decided to surprise the 200 passengers with free Samsung Galaxy Note 8. Now Samsung on a plane might make you uneasy. But the word free is something we all love. 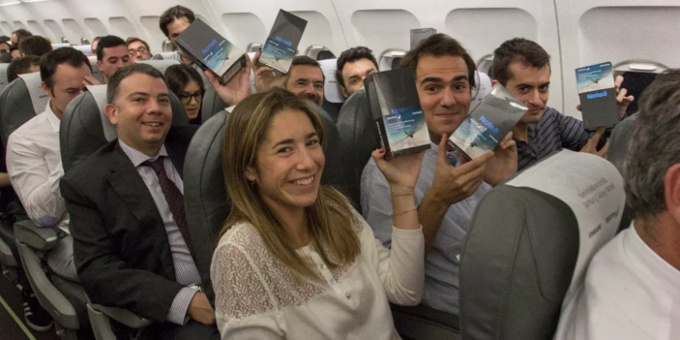 The giveway was organized by Samsung Spain on the domestic flight. It is not part of any global campaign. The phones were ‘served’ in trays by the flight attendants to the passengers and you can imagine their delight. Just look at how cheerful they seem! This giveaway is much bigger than making customers happy. This is the way the company decided to rebound after the Note 7 battery debacle. This entire deal was showing the world, especially its customers and competitors that it has recovered from the issues and is better than before. It did indeed fly and I have to add, this is one great way of apologizing to the customers! Good going, Samsung! Your fans would be proud.